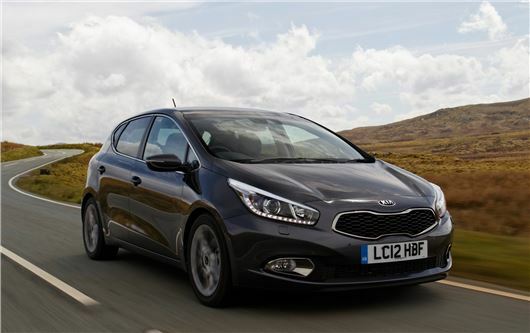 UK Car Discount has the following brand new Kia Cee'd models in stock. All vehicles are brand new with, UK supplied with full manufacturer’s warranty and service agreement including Kia’s seven year warranty. Delivery is free in mainland UK. Kia Ceed ‘1’ exterior features: 15” steel wheel, chrome surround front grille, body coloured bumpers, door handles and door mirrors, rear spoiler, tinted glass, projection headlights with levelling device, front fog lights with dark chrome surround, high LED brake lights, aeroblade windscreen wipers, electrically adjustable and heated door mirrors and heated rear window with timer. Kia Ceed ‘1’ interior features: Black ‘abstract’ upholstery, driver’s seat height adjustment, tilt and telescopic steering wheel adjustment, front console with metallic finish, centre armrest, air conditioning, steering wheel mounted controls, front electric windows with auto function, remote central locking with folding key, two 12v power sockets, centre console cup holders, illuminated cooling glovebox, front cabin map light with sunglasses case and temporary spare wheel. Kia Ceed ‘1’ audio and display features: RDS Radio/CD/MP3 player with USB, AUX, iPod and music streaming compatibility. Mobile phone Bluetooth connectivity with voice recognition, trip computer showing distance fuel consumption and average speed, external temperature display, door(s) open and washer fluid low warnings. The Kia Ceed ‘1’ safety and security features: Twin front airbags, twin side airbags, twin curtain airbags, front passenger airbag cut-off switch, impact sensing auto-door unlocking, alarm, immobiliser and dead locks, ISOFIX child seat top tethers and anchor fixings, rear door child locks, electronic stability Control (ESC) and vehicle stability management (VSM), ABS with electronic brakeforce distribution (EBD) and brake assist system (BAS), emergency stop signalling (ESS), hill-start assist control (HAC) and intelligent stop and go (ISG) (on 1.6 CRDi models only). The Kia Ceed ‘2’ model adds: 16” alloy wheels, graphite chrome grille surround with black gloss finish, cornering lights, LED daytime running lights, electrically folding and adjustable heated door mirrors with LED indicators and kerbside lights, black and silver 'Oval' interior upholstery, leather trimmed steering wheel, gearstick and handbrake, rear centre armrest, front and rear electric windows with auto function, cruise control and speed limiter, 12v luggage power socket, reversing sensors, flex steer (normal, comfort and sport modes) and locking wheel nuts. The Kia Ceed ‘3’ model adds: Privacy glass, automatic headlights, follow me home lights, front wipers de-icer, cloth upholstery with contrast 'mesh' design with faux leather trim, driver and front passenger seat height adjuster, driver and front passenger power lumbar support, dual automatic air conditioning with ioniser, 7" touchscreen with sat nav and integrated reversing camera system. The Kia Ceed’4’ model adds: 17” alloy wheels, exterior front door handle illumination, black leather seats with contrast grey trim, heated front seats, electric parking brake, centre console sliding armrest, rear air ventilation, engine start/stop button with smart entry system, premium centre console with sliding cup holder cover, speed and multifunction LCD full colour display. The Kia Ceed ‘4 Tech’ model adds: Panoramic sunroof with tilt/slide function and automatic electric roll blind, xenon adaptive front lighting system with automatic levelling, headlight washers, 10-way power adjustable driver's memory seat (tilting, sliding, reclining, lumbar, height adjustment with power lumbar support on front passenger's side, parallel park assist system (PPAS) with front and reversing sensors. For more details visit www.uk-car-discount.co.uk. Vehicles available to purchase online or if you require a finance quote contact 0161 9463500.